You are here: Home / Crafts and Charity / Socks socks socks!!! So one of the most mysterious things about crafting is that you can try and try something for ages and it just doesn’t click. Then suddenly, it all becomes clear. This happened to me with cross stitching. I just couldn’t understand the concept of transferring, through stitching, what was on the chart onto your fabric. But once I really got it — no problem! I would like to say too that these socks were made with me adjusting a pattern from a book using Amy’s and Andi’s formula for decreasing at the gusset 😀 The actual pattern called for using a stitch holder and all kinds of crazy stuff. 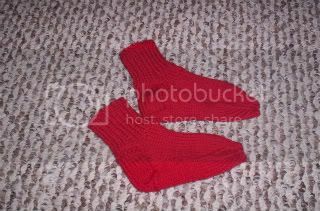 These socks are going to Afghans for Afghans cuz they are made out of Patton’s wool.